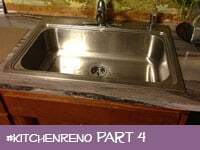 Kitchen Renovation Part 4: Who knew sinks could be so dreamy? What do you think of my new multi-function sink system? The single basin is hugeeeee. It also includes a second smaller bowl (with drain), a colander, and a solid bamboo cutting board that slide in the track. So cool. Getting rid of my old porcelain sink was certainly on the top of my priority list in my kitchen renovation. No better time to do it than with the countertop installation! 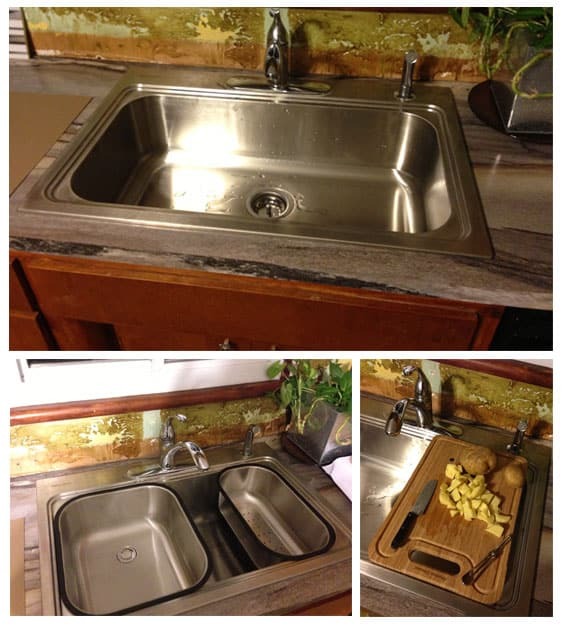 I picked up the American Standard Multi-Function Sink System (discountinued item) a few weeks before the countertop came in. It can be used as a standalone, double-wide sink that’s perfect for prepping oversized foods and washing big pots or pans. If you need a standard dual bowl, wash and rinse configuration, the track system allows the inner sink to be positioned on either the right or the left side. And it also has it’s own drain. The system also includes a colander and a solid bamboo cutting board that also slide in the track, so you can wash, rinse, peel, chop and move your food with less mess and effort. The cutting board also features a unique run-off feature. One side drains liquids directly into the sink. Flip it over and the other side keeps liquids contained when you’re working on a countertop. Since all the components are removable, you can place them on the counter if you need additional workspace. Before the new countertop could be installed, my dad and I had to remove the old sink and countertop. Removing the laminate really wasn’t a problem at all, just a few screws and some crowbar action. But, the sink posed some issues that originally we did not expect. The shut-off valves under my sink did not work. In order to remove the sink, but still have water for the rest of the house for the next few days, we needed to make a new shut off. A compression valve is one of the easiest and quickest shut off valves to install if you have copper piping in your house. Watch this great video on how to install a compression valve. I’ve been using the new sink for about 2 weeks now, and I much prefer the single basin to the double. It’s really personal preference… but I have a dishwasher so I don’t really wash and rinse using the sink. Most of the items I clean in it are the large pots that need soaking or can’t go in the dishwasher, so this is perfect. In the 2 weeks I’ve had it, I haven’t found a need for the second bowl feature yet. I have used the colander several times. It’s proved to be really useful! I’ve used it to strain my spaghetti and rinse potatoes and vegetables on a number of occassions. All-in-all, for a fickle lady like me, this sink gives me the flexibility to make it into whatever I need it to be on that particular day. The price was really reasonable, too. How do you feel about this sink being 20 gauge? Is it noisy? I just love the design but have not had a stainless steel sink. please let me know how you like your sink. I just saw it at Lowe’s and thinking about getting it for my remodel. no reviews on their website. I think we would use the small bowl for washing most of the time with a dish drainer in the single basin. Tired of dish drainer sitting on counter. the big sink would be great for holidays with roasters.